Reprint. Originally published: London: Macmillan, 1979. "George," he said, "I don't know if you'd be interested, but there's a chap who's come in with a tape of a group he runs. They haven't got a recording contract, and I wonder if you'd like to see him and listen to what he's got?" Certainly," I said, "I'm willing to listen to anything. Ask him to come and see me." "O.K., I will. 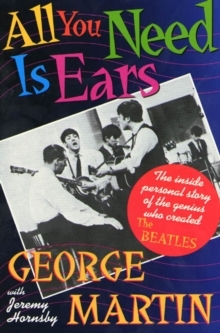 His name's Brian Epstein..." All You Need Is Ears is the story of George Martin, the man who spotted the Beatles' talent, who recorded and produced them from the start, and who brought their musical ideas to life. In this witty and charming autobiography, he describes exactly what it was like to work in the studio with the Beatles-from the first audition (and his decision to scrap Pete Best on drums) to the wild experimentation of Sgt. Pepper (complete with sound effects, animal noises and full orchestras in evening dress at the direct request of Paul McCartney).